It was almost three years ago, to the day, that I wrote about Left Arm Tan’s Alticana. That was my first foray in to LAT and I’ve never looked back. I even talked them in to playing the worst show, for the band, that I’ve ever booked. The sound system never showed up and the last minute replacement was barely good enough for karaoke much less a full band experience. I was mortified but they played anyway and we made a night of it. The respect I had for them before that show grew exponentially because of that. I’m actually a little shocked they don’t hate me, but they don’t. Daniel put Lorene in to my hands weeks ago and I was really stoked to get it and listen to it. Writing about it was a little harder. It’s an album of epic length and great songs but it wasn’t coming together for me and I didn’t want to just tell you all about some great songs. I wanted to get in to this album and get the feeling of it before I started banging away on my keyboard, flinging my thoughts in to the ether. What made it finally come together was a phone call with Daniel where he explained the album title and that completely disconcerting but oddly intriguing album cover. You see there’s this guy, Doc, who was reading this zine that someone handed him on his way home from a show and in the letters to the editor there’s this little paragraph about a phone booth in the middle of the Mojave desert. There wasn’t much to the article, except the phone number, but Doc got obsessed with this phone booth in the middle of the desert and he starts calling it, at times up to 100 calls a day, never expecting anyone to answer but knowing someone could. Then one day he gets a busy signal so he keeps calling back to make sure that whoever is using this phone booth in the middle of the desert, that he’s never seen and has no proof even exists, doesn’t get away without him talking to them. He finally got an answer, it was a cinder miner named Lorene who was making her calls. Doc eventually headed out to find the actual phone booth, in the Mojave desert, in the middle of August. There’s more to the story, and you can read it here but that’s the part of the sotry that really pulled Lorene all together for me. This is Southwestern music from start to finish, the arrangements, the vocals, the overall smoothness, everything. I couldn’t put my finger on it initially and my brain kept trying to sort it in the country and western box and it wouldn’t fit. Once I heard the story and got the desert connection in my head it made sense. So did the album cover, in a way. LAT had an artist design the cover and pretty much explained the album to him and he latched on to the desert thing and came up with a lizard licking a hairless cat. 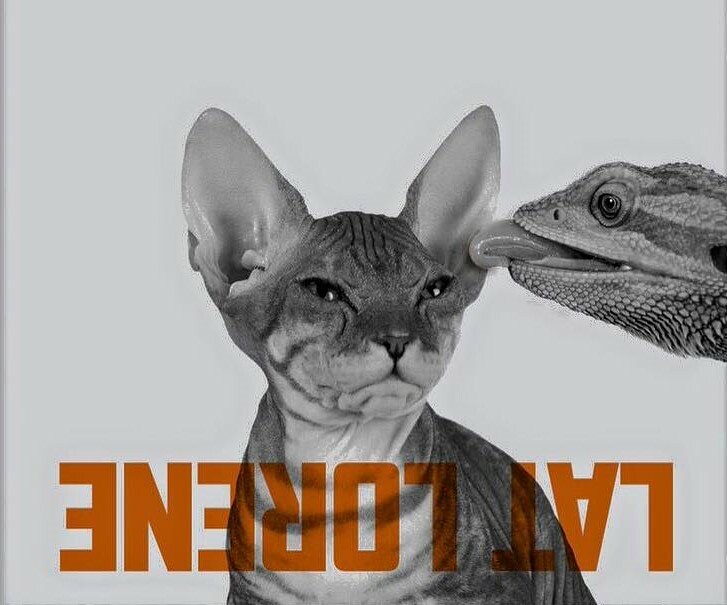 It’s the right cover for this record to be sure, it really evokes the right mood, after you get past the fact it’s a lizard licking a hairless freakin’ cat! All those words and I haven’t even really told you about the music yet, well you’ll have to forgive me, this is an 16 song opus and I wanted to set the scene for you. The reason that’s important it because once you know the story the feel of the album changes, it becomes something more than 16 good songs. The desert seems to be threading through the background of each and every track and the atmosphere seems just a little drier when music starts up. While Lorene isn’t a concept album per se, but there’s certainly a theme playing out in the music itself, completely separate from the lyrics. And yeah, I realize I’m a lyrics guy but it’s the music that speaks to me first with this one. Like Alticana there’s a smoothness to everything but this time it seems like there’s some sand hiding there somewhere that you can feel as you listen. It’s one of those things that won’t make any sense until you listen to the record but once you hear it you’ll completely get it. While the music is the thing that speaks to me the most here don’t make the mistake of thinking that the lyrics aren’t good as well. That would be sheer folly as LAT is still writing great songs. Over 16 songs and 2 alternate mixes the gamut is run from love and loss to catchy ditty and back again. With the feel of the music that I mentioned earlier I know this one is going to see a lot of play while I’m drinking in the driveway this summer. It’s really the songwriting that kept my brain wanting to put this record in the country and western box, thematically it’s a fit but it’s also more than that. There’s a lack of simplicity and there are layers in the stories that seem to overlooked in a lot of the drivel we’re expected to like these days. The attention to detail in the songwriting is such that you can almost see the shade of the red dress in “Easy” or feel the desert wind in “Where Were You”. I’m no songwriter, hell I can barely write about other people’s songs, but there subtleties in the lyrics here really make LAT stand out. When you add all of that in with the music then you end up with a really great album and I honestly don’t think there’s anyone who reads 9B that won’t find something they like about this record and for me it’s Essential Listening without a doubt. Links for ordering Lorene are on Left Arm Tan’s official site and their FB page is linked up there at the top. These guys are more than worth seeing live and I’d just about kill to see them with a decent sound system! Next Next post: 123 – LIVE: “Dates from Hell” with Comedian Cody Spyker & Musical Guests The Windermeres!